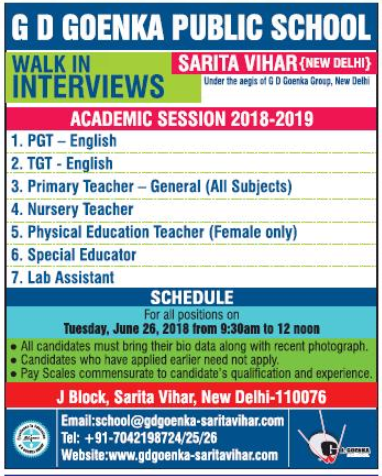 G.D. Goenka Public School, Delhi has advertised in The Hindustan Times newspaper for the recruitment of teachers PGT plus TGT jobs vacancies. Interested and eligible job aspirants are requested to appear walk in on 26th June 2018. Check out further more details below. About School: Established in 1994, G.D. Goenka Public School, Vasant Kunj was the brainchild of the G.D. Goenka Group Chairman Shri Anjani Kumar Goenka. A school that became a trendsetter in radical and progressive education, the quality of facilities and its gamut of opportunities.